You have found the internet home of the Buckeye High School Varsity Football team of Medina, Ohio, who completed their 66th Season of play at the conclusion of 2018. They had the best campaign in school history. They went 9-1 in the regular season, made their 6th straight appearance in the OHSAA Playoffs, however this time they were ranked 3rd in Division III Region 9 and hosted the Alliance Aviators at Steingass Field and got their first Playoff win 28-25 advancing to Week 12. The following week they played the 2nd ranked Kenston Bombers at Bearcat Field in Bedford and were eliminated by a 40-21 score. They broke through a barrier and history was made raising the bar for the 2019 squad and the teams that come after them. As of the end of 2017 they have scored 3,267 points against the PAC12 opponents, while giving up 1,343 in 98 Games owning a 81-17-0 conference record. This was the final season of play for the Bucks in the Patriot Athletic Conference. The PAC12 is being disolved at the end of the school year. The Bucks, along with PAC member Fairview will move to the Great Lakes Conference which was formed in 2015 and begin play in the 2019 Season. That conference now contains 7 teams and will expand to 9. The other members are Bay, Elyria Catholic, Holy Name, Normandy, Parma, Rocky River and Valley Forge. The 2018 season was the 2nd under Head Coach Greg Dennison who came to the Bucks prior to the 2017 season. The Bucks also claimed their 6th straight PAC12 Stars Division Crown, which is their 10th overall in the 14 seasons of PAC play. Coach Dennison is the 16th Head Coach in Bucks History he has a 20-3 record in his 2 seasons here. He was an assistant coach during 2016 for the Brunswick Blue Devils. Prior to that he led the Wadsworth Grizzles for 21 Seasons from 1995-2015. His accomplishents there have him in the company of some of the greatest coaches in Medina County history. He compiled a 148-77-0 recored and led the Grizzles to Suburban League Titles in 1996, 2007 and 2009 along with three regional final appearances in 1999, 2003 and 2011. His record at the end of this season gives him a 168-80 record which is good for 2nd All Time in Medina County behind Black River's Al Young who retired at the end of 2018. The Bucks held their Awards Banquet on Monday, December 3. Below are the awards presented from that and also other Awards handed out at the end of the 2018 Season! Second Team: A.J. Kirlough, Michael Knoll, Armando Nigh, Jacob Stahl & Keegan Varney. 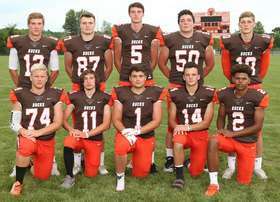 Brock Brumfield, Michael Knoll, Mickey LaRiche, Dominic Monaco, Ryan Smith, Logan Steppenbacker, Derek Thomas, Jacob Doerge, Clay Gunkelman, Derek Hosack, A. J. Kirlough, Matthew McBride, Archer Treece, Brooks Taylor, Jack Buckley and Zack Weber. Pictured above are the Senior Players this year for the Bucks. They are front row (L to R) Austin DiBiasio, Logan Steppenbacker, Mickey LaRiche, Brock Brumfield and Anthony Watkins. In the Back Row (L t0 R) Dom Monaco, Logan Schulz, Michael Knoll, Ryan Smith and Derek Thomas. The Senior Leadership is important each year. Good Luck and Have a Great Season Bucks! Head Coach Greg Dennison is back for his second season with the Bucks. Last season he led the Bucks to a 10-0 regular season before bowing out in the first round of the playoffs to the Tallmadge Blue Devils 27-14. The 2018 Schedule is the same as last season and is posted on the '2018 Schedule' page. You can find our opponents and their schedules on the '2018 Opponent Info' tab in the menu. Coach Dennison is on the left in the picture above. 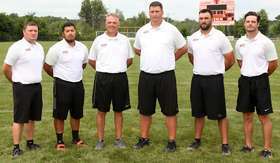 The Assistant Coaches for the Bucks are from (L to R) Defensive Line/Running Backs Coach Mike Flerchinger, Offensive Coordinator Sean Flaherty, Outside Linebackers Coach Will Krager, Defensive Backs/Wide Receivers Coach Anthony Pavia and Tight Ends Coach Evan Adams. Coach Evans & Coach Krager will coach the JV Squad on Saturday mornings. Defensive Coordinator Luke Beal is not pictured. The 2018 Campaign begins Friday, August 24th at 7:00PM as the Bucks travel to Joe Pappano Stadium in Richfield to take on the Revere Minutemen. This will be the 6th meeting of the two teams. The Bucks trail in the series 2-3 after winning last year's game at Buckeye by a score of 24-10. The Minutemen were 2-9 during the 2017 Season. Are you ready for some FOOTBALL! The Ohio High School Athletic Association oversees all sports for high school athletes. They also do the rankings for the football teams which determine which 8 teams make the playoffs at the conclusion of the season. They have alot of good information there for parents and student athletes. Here is the link to the OHSAA site. Another good site for high school football scores and rankings is Joe Eitel's site for Ohio HS scores. Joe ranks all the teams in their respective divisions and though "unofficial" for years he is now the "official" source of the OSHAA for their rankings. Last but not least if you are still not getting enough high school football information to feed your habit try Dan Pasteur's Ohio Fantastic 50, MaxPreps or JJ Huddle.